Kittu Singh reviews Rakta Charitra. A young man gets drawn into a blood curdling saga of revenge after members of his family are killed in cold blood by power hungry politicians. The young man not only avenges their death but in the process, becomes a messiah for the downtrodden. Sound familiar? Ram Gopal Varma doles out another concoction of outlaw politics with all his favourite ingredients -- an intense ensemble cast, new south Indian baddies, edgy wide angle camerawork and a trademark repetitive theme track. Sadly, Rakta Charitra lacks the taut writing of a Company or the raw reality of Satya. RGV sets the film in a fictional village called Anandpur that has lost all morality and law and is now run over by constantly warring political gundas. Narsimha Reddy is the ruling minister of the area and has a trustworthy right hand man, Veer Bhadra (played by Rajendra Gupta). Although Veer Bhadra belongs to a lower caste, Narsimha trusts him and delegates a fair amount of power to him. This enrages his brother, Nagmani, who poisons his brother's mind to strip Veer Bhadra of his power. Veer Bhadra is disgraced by this act and rallies the people of his caste to stand up against the so called upper caste. That is where the politics end and the killings begin. Nagmani has Veer Bhadra killed, so his son Mangal (Sushant Singh) goes on a killing spree, seeking revenge. Meanwhile, word is sent out to Veer's other son studying in the city. 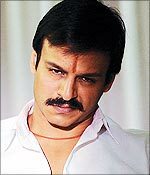 Pratap Ravi (Vivek Oberoi) learns of his father's death and rushes back leaving his estranged lover, Nandini, behind. As a viewer, you hope that the story will begin as Pratap takes an oath to avenge his family. No such luck. Abimanyu Singh, as Nagmani's barbaric son, Bhuka, plays his role with great gusto and stands out in an otherwise predictable film. Shatrughan Sinha's entry in the second half brings a spark into proceedings and you hope that the story will finally take off. But it still doesn't. Shatrughan Sinha plays Shivaji, an actor turned politician who convinces Pratap to join politics and fight his battles as this will keep him above the law. The film does have four or five memorable scenes that reminds one of RGV's brilliance, like the scene where Pratap tells his to be father-in-law that he is taking his daughter away. The camerawork is gritty but not spectacular. Art and costume are at best convenient. The background score is loud and tiresome. Once the film is over you realise that all Rakta Charitra has been is a two hour promotional fare for Rakta Charitra 2. Yes, there is more to come.